If you eat properly, then you will have a good mood. Yet many people are unaware that some foods may give us a little advantage in this area. Food can change our mood for the better or worse. In this article we explain the reasons why food can change our mood and what foods can affect our mood either positively or negatively. The first step to look good is to feel good. But there are days when our mood is not as good and this is partly due to our diet. The basic principles of nutrition are more or less known: Eating healthy foods at the correct portions. This will ensure that our body gets the proper amount of nutrients and vitamins. The relationship between food and mood is a concern of health professionals, consumers, those responsible for public health and all those interested in improving dietary habits. Eating food that we enjoy can change our mood and make us feel happy and relaxed. However, when we eat our favourite foods sometimes this lead to negative emotions such as guilt and regret. Food is one of the pleasures of life, and if possible we would prefer to eat foods we enjoy and avoid those we do not like. Proven research has shown that the consumption of our favourite foods can trigger the release of b-Endorphin, a substance that is known to improve our mood. However to gain the most pleasure from the food we like there are other factors that are taken into account like: how hungry we are, our previous experience from the consumption of that particular food and the social environment in which it is consumed. In other words, the right type of food, the right time with the right people is what will make us feel good and eventually change our mood. The strong desire for a specific type of food, or else the urge to eat certain foods appears to be very common. 60% to 90% of people indicate a strong desire to eat some specific types of food. It is interesting that men and women link different attitudes and feelings in this intense desire. Men usually interpret the strong desire for food as motivated by hunger, while women are more likely to associate food with negative mood, boredom and anxiety. Women are also more likely to show negative emotions such as guilt and regret after the consumption of food they really enjoy. Often people have the desire for “prohibited foods”, such as chocolate, potato chips, biscuits and nuts. If you consciously avoid consuming such foods, the desire to consume grows until eventually you give away to the temptation. After the consumption of food, the person feels regret and guilt and decides not to eat these kinds of foods again. As a result the mood also changes. Research has proved that the mood of a person is affected by the foods consumed, but there is little evidence on how mood affects the quantities of food consumed by one person. When we are in a good mood and happy or in a bad mood and sorrow, it is very likely that we eat foods that give us pleasure. But when we are in a really bad mood or even depression, then it is very likely that we consume larger quantities of them. What foods can change your mood? To change our mood we can include in our diet foods containing «magic» nutrients such as those listed below. Fish is anyway a good alternative to meat. The salmon, sardines and to a lesser extent the tone is rich in fat and vitamin omega 3 that helps the smooth functioning of the nervous system. This means also improving our mood. Other sources of omega 3 are plant fruits (e.g. nuts) and olive oil. There are several nutrients in the category of vitamins B such as thiamine, riboflavin, niacin, the pantothenic and folic acid. From these substances and always in connection with how they affect our mood and well being, the most important is vitamin B12 and folic acid. To secure the required quantities in our food we should eat fresh fruits and vegetables, cereals and pulses. Various studies have associated vitamin D with serotonin levels in our bodies. The latter is a major neurotransmitter and is directly related to the functioning of the central nervous system. Vitamin D is found in eggs, fish, cereals and mushrooms. The relationship between sugars and mood is complex but in general we feel good when the levels are high and vice versa. 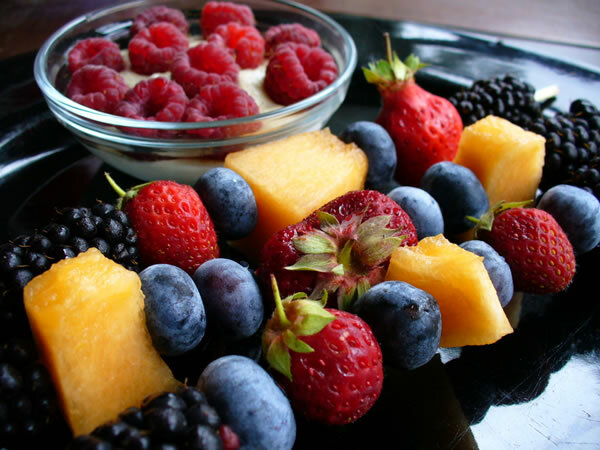 Fresh fruit and cereals are preferred because they help to maintain the levels of sugar in the blood. In contrast, chocolates and sweets cause euphoria due to a sudden increase of sugar but then as the sugar levels are reduced so is our mood. That is why the healthy sources of sugars are the best source for preserving our mood. Two snacks a day benefit the elderly who follow a poor diet. Why? Quite simply, according to a new survey, the consumption of two snacks each day can contribute to recruit sufficient calories and nutrients. For young and middle-aged, snack consumption is considered «enemy» of the Silhouette. However, as people grow the number of calories they consume tends to decline, either because of loss of appetite or because of disease or difficulty in buying food. These factors increase the risk for the elderly to follow a poor diet and to loose weight. As surveys show, even among relatively healthy people in the age of 60, those who consume foods low in protein and carbohydrates die earlier. In the new research, published in the «Journal of the American Dietetic Association» researchers found that snacks are an important source of calories and nutrients for older people. In general those who prefer to eat a snack consume more calories, protein, carbohydrates and fat than those who do not prefer snacks. According to the authors of the study, these nutrients may benefit elderly men and women. The researchers believe that the elderly who have lost weight or have decreased appetite they should add some snacks in the daily diet or make use of nutritional supplements. However, the researcher believes that we should avoid «useless» snacks such as chips and prefer fruits, vegetables, yoghurt, tuna and whole grain cereals. We all know that breakfast is the most important meal of the day especially for children. However, studies shows that while all infants and preschool children eat a full breakfast everyday (usually cereal and milk or toast with milk and fruit juice), when they become in the age of 7-8 years they gradually abandon breakfast. After the age of 10, 30% -40% of children are leaving the house without eating anything or with only a glass of milk which is not considered a full breakfast. The lack of proper breakfast may be the reason for some bad consequences. Studies have shown that children who do not eat breakfast often have more weight than normal and perform not as good in courses that require mental concentration and alertness. They often seem more tired with a bad mood. Therefore, children must learn to wake up earlier and eat a balanced breakfast without being in a hurry. In practice, this means that they will eat mainly carbohydrates and proteins,vitamins, minerals and fibre. Good ideas are a cup of milk with cereals whole grain and a fruit or a couple of slices whole grain bread, a little cheese and fruit or toast (whole grain bread, ham, cheese) and fruit. When we are tired and also in a bad mood, we look for something sweet. Indeed sweets give us a quick dose of energy but it is lost too soon because of a drop in the blood sugar levels. The best solution is to try fruits such as apples, bananas, and watermelon. They are rich in nutrients, fiber, minerals and vitamins and also they do not harm your silhouette, or cause any fluctuations in the sugar levels. When people are in a bad mood they tend to eat more unhealthy food. But when they have information on the nutritional value of the foods they consume, are limiting the consumption of food that offers them pleasure. Unlike the people who are in a good mood, even if they have information about the nutritional values of the food, they still consume more quantities of those foods. The information on the nutritional value affects the amount of food we eat when we are in a bad psychological state with bad mood or depression. It is better for our health, to read the information about the nutritional value of food we choose so as to offer pleasure to our selves from food those difficult times. post is great. Food changes and effects our mood. Think of when you are really tired and feel like you are dragging. Are you eating foods with enough iron? If you eat a healthy breakfast in the morning this changes your energy level through the morning and you may feel more tired later in the morning if you didn’t eat. You then spend your morning hungry, cranky thinking of lunch time.